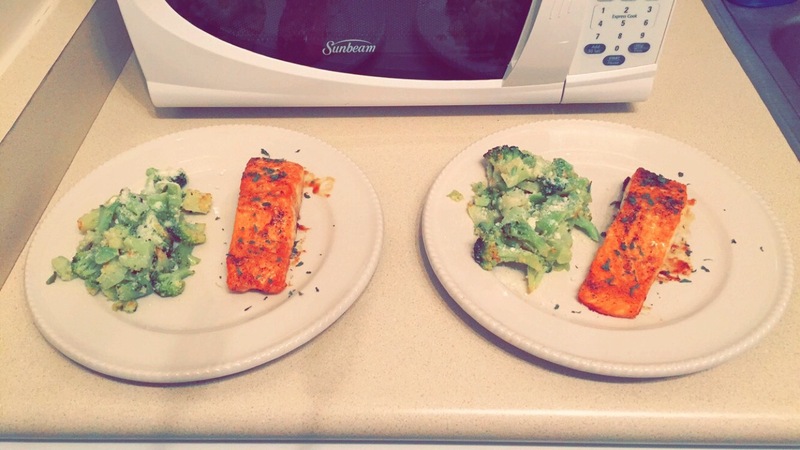 The salmon came out perfect. It didn’t taste anything like the other salmon recipe that I had made the week before. And it should be noted, that I’m not a huge fan of salmon. I’m more of a steak girl than a fish girl. But this particular salmon recipe was so delicious that I really want to make it again. SOON. The broccoli was pretty good too. I really enjoyed having a different way of making something that’s so common. It made broccoli feel new to me again and given my extensive history with broccoli that was no easy task. Arrange the salmon pieces in a 9 x 13 inch baking dish. Reheat oven to 425 degrees. Drizzle a little olive oil on a large baking sheet, then use a paper towel to rub the pan down. Sprinkle broccoli with Parmesan cheese before serving.